The Athens Transit System, otherwise known as “The Bus,” has undergone marked changes to 10 of its 20 routes as of July 1 this past summer. These adjustments were made with the intention to expand ridership, increase cost-effectiveness and decrease the length of wait times at hundreds of bus stops throughout the city, according to the ATS. Why It’s Newsworthy: Changes to bus routes affect riders, both students and non-students, but especially those who live off-campus and rely on transit to move between home, work and campus. Routes 5 and 7, which run through Beechwood, Baxter Street and the west side, have changed the most. These buses have now expanded service to Whitehead Road and Jefferson Road, areas which previously lacked access to city transportation. Public transportation is essential for some people to move between their homes and work or school. Downtown Athens is the hub of activity for students and service industry workers; many of whom live off-campus – or further from this epicenter – where affordable housing is becoming increasingly sparse. Therefore, any changes affect students and non-students alike. Since 1976, Athens Transit has coordinated with the University of Georgia to maximize efficiency for the significant student demographic. 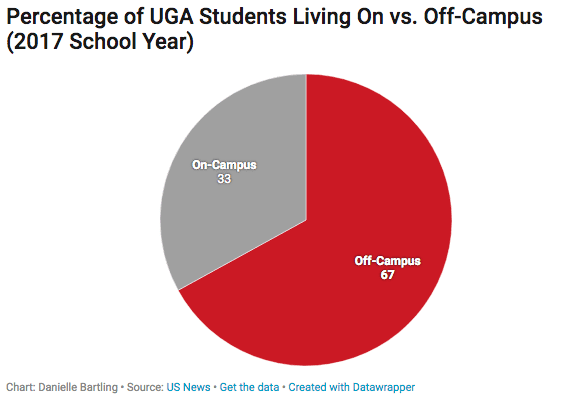 Students enrolled at UGA compose more than 29 percent of Athens-Clarke County population; and with roughly 10,655 employees, the University of Georgia is the top employer of Athens-Clarke County. This relationship exists to reduce decongestion of campus and county roads and increase student access between campus and off-campus housing, among other reasons. Additionally, as of Sept. 10, Route 5 began to function along a 75-minute headway, adding 15 minutes to each ride, as opposed to a 60-minute schedule. Routes 8, 9, 12, 14, 22, 25, 26, and 27 have also been altered in various ways; most notably, Athens Transit buses avoid the main artery of campus, Sanford Drive. At the Multimodal Transportation Center, the previous route map from 2013 is hanging on the wall. The updated map can be found on the Athens Transit website. “Sanford Drive road closures are expected to commence in Fall 2018, and will continue for the duration of the project… Construction-related closures will require rerouting of all seven ATS routes, which will also support the University’s goals to reduce vehicular travel in the campus core,” as stated in the revised 2018 Athens-Clarke County Transit Development Plan earlier this year. According to the 2016 Athens Transit Feasibility Study, “current conditions and service models do not support full system consolidation” between Campus Transit and ATS, so decisions are being made to optimize routes and prevent overlapping. While these types of changes are implemented with both student and non-student riders in mind, not everyone is pleased with the decision. Haleigh Shumake, a junior advertising major, expressed discontent regarding the adjustment of Athens Transit Route 14, particularly. “It’s a big inconvenience,” she said. Shumake lives at the Park at Athens: Lakeside, which is serviced only by Route 14 when classes are in session. Previously, the route would drop her off right in front of her destination on Sanford Drive–Dawson Hall, but now she must walk for at least 20 minutes to get to class. Arryn Hassel, a recent UGA graduate in psychology, has worked at the UGA Hotel on South Lumpkin Street, further up Sanford Drive, for two years. She lives off Lexington Road and doesn’t own a car, so she has relied on Athens Transit Route 25 (or 26) to move between home and her job on campus. But ever since the reroute this summer, she has been catching rides with others to work. The nearest bus stop is a 10-minute walk from her residence; and with the route change, her elapsed travel time has increased two-fold. She described the exertion of catching multiple buses then walking home after a long shift as “intense,” especially during hot summer months. After work, Hassel walks almost a mile to the Main Library bus stop, where Route 25 is due to arrive at 3:20 p.m. She said she “freaks out” when it’s 3:01 and she has not yet clocked out from the hotel; she worries the bus will depart without her since it’s a 19-minute walk, approximately. Although, the bus is often late anyway, she said. “What was the point of optimizing the routes if it’s still gonna be late getting to these bus stops?” Hassel asked. Hassel said she feels lucky because, although she graduated in May, she remains an employee of the University and still possesses valid UGA identification to get home after work. With the swipe of a valid UGACard, students, faculty and staff may ride fare-free on ATS due to a longstanding contract with the University. Non-students must either pay per ride or obtain a 22-ride pass, like Chandra, who lives on the east side and requested to be referred to by first name only. “It doesn’t affect me personally, but I knew that [the reroute] was gonna affect a lot of people,” Chandra said at the Multimodal Center, clutching her pink-and-white-striped ATS bus pass. Because she doesn’t have a job, or anywhere that she absolutely needs to be at any given time, she often walks. And she considers herself far less dependent on buses than students or people in the workforce. “Sometimes I just try to be patient and go with the flow,” Chandra said. But others at the Multimodal Center appeared to be in a bigger hurry. “If anything, they should have added more buses,” said Joan Hanes as she waited for her bus, patience dwindling after 45 minutes sitting on a bench. Hanes works at the Varsity on Broad Street, but lives on the east side. Her bus routes–2, 3 and 20–were not optimized during the reroute. While she understands ATS is “doing their best,” she has long been frustrated with the bus routes and their wait times. “I’m late getting home, I’m late getting to work. I’m late getting home, I’m late getting to work,” Hanes emphasized the cycle she feels caught in. “By the time I get home, it’s time to go to bed. Then I gotta get right back up again,” Hanes said. By this time, she was supposed to be home to attend a young relative’s birthday party.